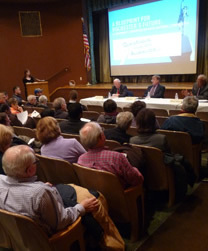 The Community Design Center coordinated a panel discussion with all Rochester mayoral candidates to bring forward issues related to land use, neighborhood and urban planning, and development and revitalization. A special thank you to Carl Pultz for recording these lectures! Click the link below each speaker to listen to the lecture online. Click here to listen to this event's Podcast. Click here to download Mayor White's Powerpoint. "Mobility: Transportation as a Leveler"
Click here to download Senator Steve Farley's Powerpoint. "Setting the Stage: What Is Equity by Design?" Click here to download Anne-Marie's Powerpoint. "Considering Strategies for Rochester's Redevelopment "
President, Rochester Downtown Development Corp.
Senior Principal, Icon Architecture, Inc. Principal, Director of the New York Office, Cooper Carry, Inc. Principal, ACP Visioning and Planning, Ltd.
Bombardier Chair in Sustainable Transportation, University of British Columbia. Author: "Sustainable Urbanism: Urban Design with Nature"
Author: "Bourgeois Utopias: The Rise and Fall of Suburbia"
Principal and Senior Traffic Engineer, Glatting Jackson Kercher Anglin Lopez Rinehart, Inc.